Cardiff Blues rugby and Cardiff City have signed a deal that will see rugby and football played at the new 30,000-seater stadium at Leckwith. The Blues will quit their Arms Park home in 2009, along with City who are leaving Ninian Park. "I have no doubt that the new stadium will be the springboard for success for both teams for many years to come," said Blues chairman Peter Thomas. City chairman Peter Ridsdale added: "This arrangement makes total sense." Only last week, the two clubs were given the go-ahead for new rugby and football pitches, as part of a sports academy in the Vale of Glamorgan. Anybody got any views on the egg chasers... coming to our new stadium? "Our new stadium will be something that everyone in the city of Cardiff will be proud of, and this agreement ensures that professional sport within the city and indeed far beyond can be seen to be prospering side by side," said Ridsdale. "Supporters of both teams will enjoy facilities that in the past could only have been dreamt of." The move to Leckwith had been initiated by former Bluebirds chairman Sam Hammam in January 2002 but Hammam later revealed that the club were saddled with debts of almost £30 million. Since the arrival of Ridsdale as chairman though, the project has got back on track and in March the stadium plans were altered to allow construction to begin as soon as possible. 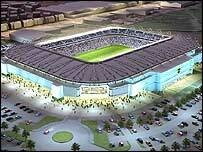 The ground will initially seat 25,000, but can be increased to 30,000 without any structural changes made to the ground. Blues chief executive Robert Norster said: "This decision will undoubtedly be received with mixed emotion, as many of us will have our own special and cherished memories associated with the Arms Park." But he said rugby will still be played at the Arms Park with Cardiff RFC playing their home games there. Norster will hope the move echoes the success of rivals the Ospreys who ground-share with Swansea City at the Liberty Stadium. Since their move, the Ospreys have seen their following increase since they moved to the 20,500-capacity venue. The Blues already attract healthy crowds in the Magners League and use the Millennium Stadium next door for bigger matches due to the size of the Arms Park. Last October, around 26,000 turned up for the Heineken Cup showdown with Leicester and the Blues are looking to switch their clash with Bristol in November too.